His recent book The Global Stock Market: Issuers, Investors and Intermediaries in an Uneven World (OUP 2011) offers a comprehensive picture of the global stock market by focusing on the relationships between issuers, investors, and intermediaries and how these relationships impact the performance of stock markets and the economy of cities, countries, and the world. The book uses rich data and global case studies to examine the rise of emerging markets, the impact of the global financial crisis, the revolution in the stock exchange business model, and the continued dominance of London and New York as financial centres. The Geography of Finance: Corporate Governance in a Global Marketplace (OUP 2007) co-authored with Gordon L. Clark tackles crucial issues regarding the emerging global market for corporate governance. It describes and explains the transformation of European corporate governance in the light of the imperatives driving global financial markets, using and innovative analytical and empirical framework. At present he is co-editing the New Oxford Handbook of Economic Geography to be published by Oxford University Press in 2016, and preparing two monographs Financial Centres Under Pressure and Global Financial Networks and the Offshore World. Dariusz has a Master's Degree in Geography from Jagiellonian University (1997), Cracow, a Master's Degree in Economics from the Cracow University of Economics (1996), and an MSc in Finance and Banking from Stockholm University (1996). He came to Oxford in 1998 as a scholar of the Open Society Institute and the Foreign and Commonwealth Office, and was awarded the University Studentship in association with Jesus College for a DPhil, completed in 2003 with a thesis entitled "Corporate Governance and Capital Market Integration in Europe: an Economic Geography Perspective". From 2003 to 2005 he was a Junior Research Fellow at Jesus College, Oxford and an outside Lecturer at the London School of Economics and Political Science. Between January 2006 and June 2007 he was a Lecturer at the Department of Geography, the University College London. He was appointed a Lecturer at the School of Geography and the Environment and a Fellow of St Peter's College, Oxford in July 2007. In 2015 Dariusz joined Jan Zielonka and Timothy Garton Ash on the Steering Committee of the Programme on Modern Poland, a multidisciplinary initiative to foster teaching and research on contemporary Poland, and academic relationships between Poland and Oxford University. Dariusz is the inaugural Chair of the Global Network on Financial Geography www.fingeo.net. Dariusz Wójcik's current work focuses on the global financial landscape emerging in the wake of the global financial crisis 2007-9. It is based on the premise that the crisis constitutes a major juncture in the history of capitalism, and major changes are necessary in the governance structure of the global economy, as well as in the social scientific approaches to explaining economy. His research combines insights derived from geography, economics, political economy, sociology and anthropology and is based on both quantitative and qualitative research methods, including elite interviews. The topics related closely to the global financial crisis include a review of competing interpretations of the crisis 2007-9; the role of the New York - London axis in the crisis; the role of advanced business services and the offshore world in the transformation of the world economy since the collapse of the Bretton Woods system; and the impact of the financial crisis on financial centres around the world; and the evolution of offshore financial centres and networks. The more theoretical strand involves the future agenda of economic geography, including the intersection of economic geography with post-Keynesian economics, political economy, and accounting, as well as the concept of Global Financial Networks. Other topics include the geography of economic thought, the role of location in the underpricing of Initial Public Offerings on the stock market, the role of financial centres in the international monetary system, and the future of sustainable finance. In 2016 Dariusz has been awarded a prestigious European Research Council Consolidator Grant of €2m over five years for the project Cities in Global Financial Networks: Finance and Development in the 21st Century. This study will focus on how financial and business services, including law, accounting, and business consulting, have been affected by the global financial crisis and the Eurozone crisis, and how they are changing in response to new financial regulation, the rise of the Global South, and the digital revolution. The project will develop the theory of Global Financial Networks, create the first Atlas of Finance, and investigate the impacts of finance on urban, regional, and global development. His most recent research outputs are available as working papers on the Social Science Research Network. At the undergraduate level Dariusz convenes the 'Human Geography' course for Prelims, the 'Space, Place and Society' course for 2nd year students, as well as the 'Geographies of Finance' option. He is a tutor at St Peter's College, where he has taught and supervised dissertations of over thirty students since 2007. At the graduate level Dariusz co-convenes the course on 'Economy and Development' for the MSc in Nature, Society and Environmental Governance. 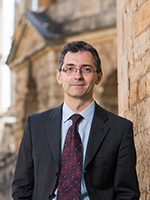 He has supervised over twenty MSc students, and fifteen DPhil students, in addition to mentoring visiting research students and postdoctoral researchers. Wójcik, D. (2011) The Global Stock Market: Issuers, investors and intermediaries in an uneven world. Oxford University Press. pp. 224. ISBN: 978-0-19-959218-0. Clark, G.L. and Wójcik, D. (2007) The Geography of Finance: Corporate Governance in the Global Marketplace. Oxford University Press, Oxford. Chwierut, S., Kulis, M., Stylo, W. and Wójcik, D. (2000) Elementy Zarządzania Finansowego w Ochronie Zdrowia (Elements of Financial Management in Health Care). Cracow: Vesalius. Haberly, D. and Wójcik, D. (2017) Culprits or Bystanders? Offshore Jurisdictions and the Global Financial Crisis. Journal of Financial Regulation, 3(2): 233-261. Haberly, D. and Wójcik, D. (2017) Earth Incorporated: Centralization and Variegation in the Global Company Network. Economic Geography, 93(3): 241-266. Knight, E. and Wójcik, D. (2017) Geographical linkages in the financial services industry: a dialogue with organizational studies. Regional Studies, 51(1): 116-127. Pan, F., Zhang, F., Zhu, S. and Wójcik, D. (2017) Developing by borrowing? Interjurisdictional competition, land finance and local debt accumulation in China. Urban Studies, 54(4): 897-916. Wójcik, D., Knight, E. and Pažitka, V. (2017) What turns cities into international financial centres? Analysis of cross-border investment banking 2000–2014. Journal of Economic Geography. Wójcik, D., MacDonald-Korth, D. and Zhao, S.X. (2017) The political–economic geography of foreign exchange trading. Journal of Economic Geography, 17(2): 267-286. Hogarth, J.R. and Wójcik, D. (2016) An evolutionary approach to adaptive capacity assessment: a case study of Soufriere, Saint Lucia. Sustainability, 8(3). Hogarth, J.R. and Wójcik, D. (2016) An evolutionary approach to adaptive capacity assessment: A case study of Whitehouse, Jamaica. Journal of Rural Studies, 43: 248-259. Pan, F., Zhang, F., Zhu, S. and Wójcik, D. (2016) Developing by borrowing? Inter-jurisdictional competition, land finance and local debt accumulation in China. Urban Studies, 54(4): 897-916. Pan, F., Zhao, S.X.B. and Wójcik, D. (2016) The rise of venture capital centres in China: A spatial and network analysis. Geoforum, 75: 148-158. Haberly, D. and Wójcik, D. (2015) Regional blocks and imperial legacies: mapping the global offshore FDI network. Economic Geography, 13(07). Wójcik, D. (2015) Accounting for globalization: evaluating the potential effectiveness of country-by-country reporting. Environment and Planning C, 33(5): 1173-1189. Wójcik, D. and Camilleri, J. (2015) ‘Capitalist tools in socialist hands’? China Mobile in global financial networks. Transactions of the Institute of British Geographers, 40(4): 464-478. Wójcik, D. and MacDonald-Korth, D. (2015) The British and the German financial sectors in the wake of the crisis: size, structure and spatial concentration. Journal of Economic Geography, 15(5): 1033-1054. Coe, N., Lai, K. and Wójcik, D. (2014) Integrating finance into global production networks. Regional Studies, 48(5): 761-777. Haberly, D. and Wójcik, D. (2014) Tax havens and the production of offshore FDI: an empirical analysis. Journal of Economic Geography, 15(1): 75-101. Kreston, N. and Wójcik, D. (2013) Interpreting the Crisis, Envisioning the Future. Geopolitics, 18(4): 954-960. Wójcik, D. (2013) The dark side of NY-LON: financial centres and the global financial crisis. Urban Studies, 50(13): 2736-2752. Wójcik, D. (2013) Where governance fails: advanced business services and the offshore world. Progress in Human Geography, 37(3): 330-347. Wójcik, D., Kreston, N. and McGill, S. (2013) Freshwater, saltwater and deepwater: efficient market hypothesis versus behavioural finance. Journal of Economic Geography, 13(2): 257-277. Appears in: Special Issue: Global Retail and Global Finance – Honouring Neil Wrigley. Wójcik, D. (2012) The end of investment bank capitalism: An economic geography of financial jobs and power. Economic Geography, 88(4). Wójcik, D. (2011) Securitization and its footprint: the rise of the US securities industry centres 1998-2007. Journal of Economic Geography, 11(6): 925-947. Lew, S. and Wójcik, D. (2010) The variegated cultures of philanthropy: National and corporate impacts on private foundation governance. Competition and Change, 14(3-4): 152-175. Wójcik, D. and Burger, C. (2010) Listing BRICs: Issuers from Brazil, Russia, India and China in New York, London and Luxembourg. Economic Geography, 86(3): 275-296. Wójcik, D. (2009) Financial centre bias in primary equity markets. Cambridge Journal of Regions, Economy and Society, 2(2): 193-209. Wójcik, D. (2009) Geography of stock markets. Geography Compass, 3(4): 1499-1514. Wójcik, D. (2009) Geography, stupid! A note on the credit crunch. Environment and Planning, A, 41(2): 258-260. Wójcik, D. (2007) Geography and future of stock exchanges: between real and virtual space. Growth and Change, 38(2): 200-223. Wójcik, D. (2007) The International Finance Index and its Derivatives. Working Papers in Work, Employment and Finance, 12/07. School of Geography and the Environment. Available on www.ssrn.com. Wójcik, D., Beaverstock, J. and Sidaway, J. (2007) European financial geographies. Growth and Change, 38(2): 167-173. Clark, G.L., Wójcik, D. and Bauer, R. (2006) Geographically dispersed ownership and inter-market stock price arbitrage - Ahold's crisis of corporate governance and its implications for global standards. Journal of Economic Geography, 6(3): 303-322. Wójcik, D. (2006) Convergence in corporate governance: evidence from Europe and the challenge for economic geography. Journal of Economic Geography, 6(5): 639-660. Clark, G.L. and Wójcik, D. (2005) Financial valuation of the German model: The negative relationship between ownership concentration and stock market returns. Economic Geography, 81: 11-30. Hebb, T. and Wójcik, D. (2005) Global standards and emerging markets: the institutional-investment value chain and the CalPERS investment strategy. Environment and Planning, A, 37(11). Clark, G.L. and Wójcik, D. (2003) An economic geography of global finance: ownership concentration and stock-price volatility in German firms and regions. Annals of the Association of American Geographers, 93(4): 909-924. Clark, G.L. and Wójcik, D. (2003) Path dependence and financial markets: the economic geography of the German model, 1997-2003. Environment and Planning, A, 37(10): 1769-1791. Wójcik, D. (2003) Change in the German model of corporate governance: evidence from blockholdings 1997 - 2001. and Planning A, 35(8): 1431-1458. Wójcik, D. (2002) Cross-border corporate ownership and capital market integration in Europe: evidence from portfolio and industrial holdings. Journal of Economic Geography, 2(4): 455-491. Wójcik, D. (2002) The Länder are the building blocks of the German capital market. Regional Studies, 36(8): 877-895. Clark, G.L. and Wójcik, D. (2001) The City of London in the Asian crisis. Journal of Economic Geography, 1: 107-130. Wójcik, D. (2009) The role of proximity in secondary markets. Chapter 6 in, Clark, G.L., Dixon, A.D. and Monk, A.H.B. (eds.) Managing Financial Risks: From Global to Local. Oxford University Press, Oxford. pp. 140-162. ISBN: 9780199557431. Clark, G.L., Hebb, T. and Wójcik, D. (2007) Institutional investors and the language of finance: the global metrics of market performance. Chapter 2 in, Godfrey, J.M. and K. Chalmers (eds.) Globalisation of Accounting Standards. Edward Elgar Publishing. ISBN: 15. Wójcik, D. and Cojoianu, T. (2017) Unfinished business:change in the US securities industry since 2008. Financial Geography Working Paper Series 25 pp. ISSN: 2515-0111.